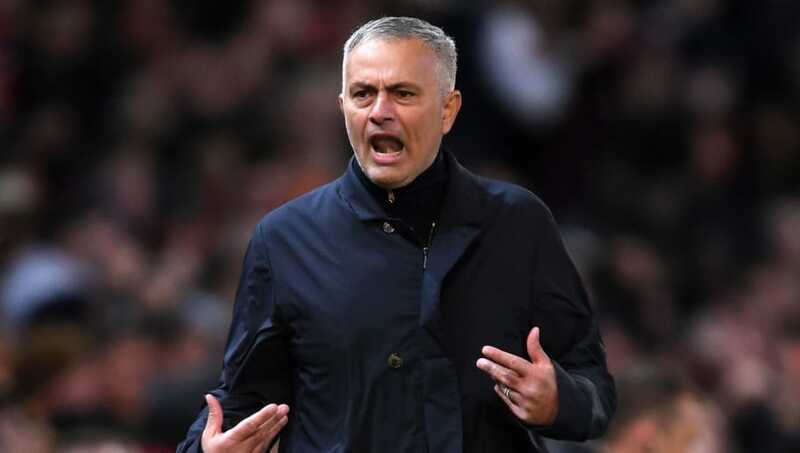 Real Madrid are lining up Manchester United manager Jose Mourinho to take over at the end of the season​, according to one report from Spain. Real have endured a poor start to the season, and their winless run extended to five matches on Saturday as they suffered a shock home defeat to Levante which leaves them seventh in La Liga, four points behind leaders and fierce rivals Barcelona ahead of next weekend's Clásico. Real Madrid also set a club record for the most consecutive minutes without scoring a goal, which was finally brought to an end by Marcelo's goal, but it wasn't enough to prevent a third consecutive loss. The pressure is ramping up on Julen Lopetegui, who was only appointed in the summer as Zinedine Zidane's replacement but is struggling to live up to the high standards set by his predecessor. While most reports put Antonio Conte or Real Madrid Castilla manager Santiago Solari as the most likely successor should Lopetegui get the chop, ​El Chiringuito presenter Josep Pederol has posited the unlikely scenario tnat Mourinho is actually Real's preferred long-term replacement, but is unlikely to take the job immediately if the Spaniard is sacked. It is claimed that Castilla manager Solari would take the job as a stop-gap appointment until former boss Mourinho can be appointed next summer. Mourinho was an unpopular figure among supporters by the end of his relatively unsuccessful first spell at the Santiago Bernabeu between 2010 and 2013. Given this, and the fact that he is currently struggling at Old Trafford, it would seem a strange appointment. Almost as strange are the reports from ​COPE which suggest that the solution to ​Real's goalscoring problems is Zlatan Ibrahimovic. The Swede has been on fine form in Major League Soccer with 21 goals in 25 games for LA Galaxy, and (despite being 37) ​has recently been tipped for a return to Europe. Ibrahimovic played under Mourinho at Inter and Manchester United, and the two are known to have a good relationship. However, for now, a reunion in the Spanish capital remains an outlandish rumour, with neither men long-term solutions to the issues in Madrid.